Because Charleston is such a tourist town, those of us who are lucky enough to live there are often called upon to play tour guide in this wonderful city of ours -- and nothing makes you realize how little you’ve explored your own city than out-of-town guests asking for activity recommendations. Fear not, for we’ve curated this list of awesome things in Charleston that are actually worth doing that will give you some serious street cred with your out-of-town friends, so you can go back to your daily ritual of bingeing whatever’s new on Netflix. Here’s everything you need to do in Charleston, no matter your budget. 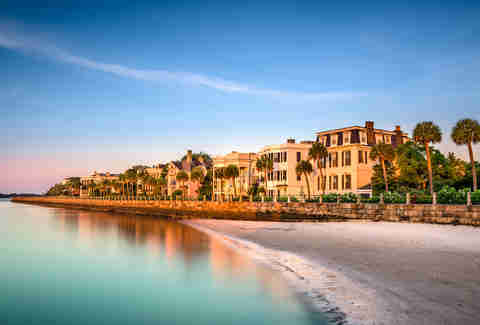 There’s no denying that one of Charleston’s major attractions, especially during the warmer months, are its many area beaches only a short drive away. 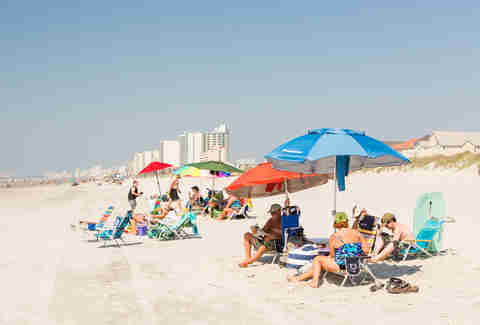 You can’t go wrong by heading to Folly Beach, Isle of Palms, Sullivan’s Island, Edisto, Kiawah, or Seabrook -- unless you forget to pack the sunscreen, that is. Walk to "The Edge of America"
If you pick Folly Beach for your day trip, know this: in addition to having a great shoreline, Folly’s known locally as “The Edge of America,” so you owe it to yourself to walk out to the end of the island and get a close-up (well, relatively close-up) view of the Morris Island Lighthouse with a self-guided tour. Drive to the end of East Ashley Avenue, park on the side of the road (make sure all four tires are in the dirt! ), and enjoy the local graffiti on the street as you hike out to where the sidewalk ends (which is also known as Rat Island, but don’t let that deter you). You’ll probably work up an appetite, so swinging by Folly’s best restaurants afterward is a must-do as well. The Commodore is the phoenix rising from the ashes of A Touch of Class, a jazz club that was popular back in the day. This new iteration maintains the vintage jazz club feel with live jazz & funk bands, making it basically the closest thing Charleston has to a speakeasy. The $5 cover is totally worth it to enjoy the house band or touring groups, and dance all night to music you’re not likely to hear on the radio anytime soon. 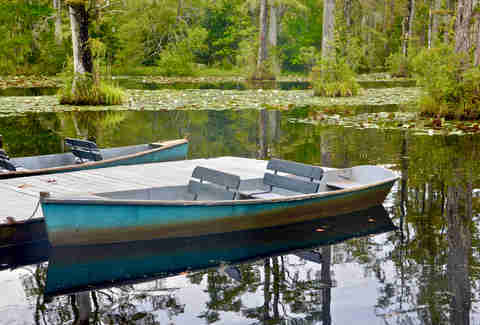 If you remember the scene from The Notebook when Noah and Ally were paddling their boat amongst hundreds of swans and thinking “that’s the most magical, enchanting, romantic thing I’ve ever seen,” then a trip to Cypress Gardens is not to be missed. It’s about a 45 - 60 minute drive from Downtown Charleston, depending on traffic, but it’s one of the more unique sites to visit in the lowcountry. In addition to the swamp boats, there’s a butterfly house, walking trails, and a swamparium (like an aquarium but for creatures commonly found living in a swamp). The trails reopen on April 13th this year, so mark your calendar now! Between the Shepard Fairey murals, David Boatwright’s restorations, and Patch Whiskey’s many colorful acid monsters, there are a ton of street artists who’ve left their mark in Charleston. You can find colorful street art everywhere from downtown to West Ashley to Mount Pleasant (and even on the trains that run through the port), and the unique artistry makes for a great backdrop for an Instagram post. Escape rooms are becoming trendy throughout the US, but the games at Time Traveler Escape Rooms infuse a bit of Charleston history into their rooms to give you a truly unique experience. The rooms consist of Lavinia Fisher’s Boarding House (you might recognize her as being America’s first female serial killer), Dr. Trott’s Apothecary (named for a pharmacist in the 1860’s known for collecting odd sea specimens, reminiscent of Ripley’s Believe It or Not! ), and the soon-to-open Vincent Chicco’s Speakeasy (named after a Charleston businessman who did in fact own a number of speakeasies during prohibition). The Battery is the edge of Charleston’s peninsula downtown, and includes a sidewalk (which used to be the walls of the city) that stretches roughly from Tradd Street to Water Street. You’ll get fabulous views of the harbor (if you squint, you can even see Fort Sumter), and the area’s also adjacent to White Point Gardens, a city park with a gazebo and old cannons throughout. Perfect for a picnic on a sunny afternoon! One of Charleston’s most iconic sites is the Arthur Ravenel Jr. bridge (aka the Cooper River Bridge), which connects downtown Charleston to Mount Pleasant. The spires adorn everything from clothing to local business logos, and are the star of the Cooper River Bridge Run every April. Make sure you bring some good walking shoes and set aside an hour or so to trek across the bridge. Be sure to bring a camera, as the photos from the top of the harbor are seriously Insta-worthy. Sure, the idea of touring a cemetery seems more like a punishment than a proper vacation activity. But Charleston’s cemeteries date back to before the US was a thing, and feature the final resting place of prominent American figures like John C. Calhoun… so it’s actually pretty cool, in addition to being creepy. Plus, The Unitarian Church graveyard features a relaxing tree-lined path between King Street and Archdale that’s super picturesque. The city’s food scene was already nothing to sneeze at, but over the last few years, it’s blossomed into a nationally undeniable culinary juggernaut. 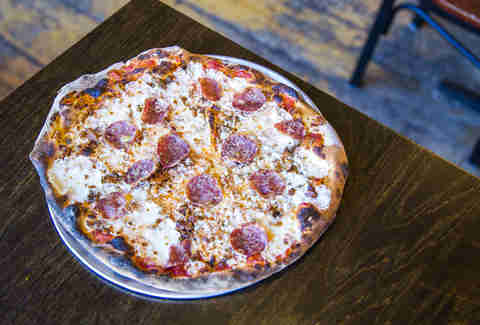 We’ve got a whole article running down the best restaurants in Charleston right now, but here’s an abridged version for those in a rush: grab a pie at EVO Pizzeria, some BBQ at Home Team, tacos at Minero, and literally anything on the menu at Husk. That being said, picking THE perfect restaurant to take your guests to is akin to picking your favorite child; there are so many good options that the pressure to narrow it down to one can sometimes be too much. 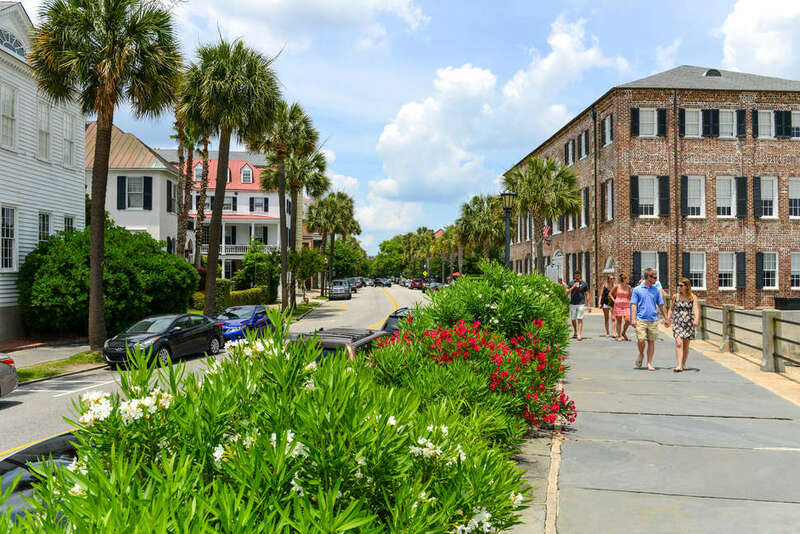 Taking a culinary tour is a great way to bypass that, as you get to try bites from a few fantastic restaurants and learn a little bit about Charleston’s history at the same time. Talk about a tasteful education! Charleston’s farmers markets are more than just open-air zones for fruits and veggies; they also feature local artisans, live music, snacks, and a whole lot more, and are a great way to experience some local Charleston culture and encourage your guests to support local businesses. Many of them -- like the Johns Island Farmers Market and the Pacific Box & Crate Farmers Market -- happen year-round, and can be found throughout the city on various days of the week, so be sure to find the one that’s closest to you. The Old Village in Mount Pleasant is somewhat off the beaten path -- in that you might not even know it was there if you weren’t looking for it. Afterwards, take a walk down the Pitt Street Bridge. While not as iconic or widely appreciated as the Cooper River Bridge, the Pitt Street Bridge is a fun hidden gem that’s just as picturesque in its own way. The Angel Oak tree is the only tree we know of with a bedtime (the park that the tree inhabits closes at 5pm sharp), and although you definitely have to drive down a dirt road to see it, the journey is totally worth it. 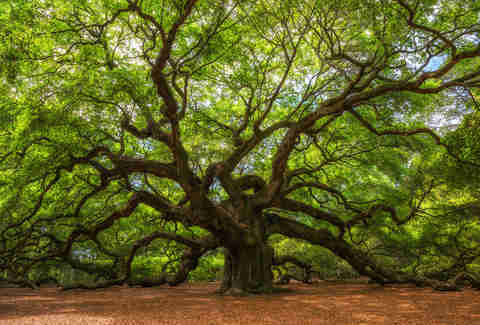 Angel Oak is roughly 500 years old, and it’s probably the largest dang oak tree you ever did see. History buffs will enjoy touring this retired naval aircraft that’s now a floating museum over in Patriot’s Point. The boat is massive, and even though only a portion of it is available for public viewing, you can spend more than a couple of hours walking along its many hallways. Up on the flight deck, you’ll see examples of different aircraft that have landed on it in the past, and also get some pretty fantastic views of the Charleston Harbor. Sure, Charleston’s got more than enough dining options to keep your meals varied, but what about when you want a drink? All we’ve got are places like the cocktail-slinging Gin Joint, tiki-inspired Cane Rhum Bar, Bavarian-style Bay Street Biergarten, divey Recovery Room… actually, there are plenty of bar options in the Holy City, too. Check out our full list of the best bars in Charleston right now, and you’re bound to find a spot you haven’t tried yet. Charleston is home to a plethora of artists who display their works in over 40 art galleries in downtown Charleston. The Charleston Gallery Association celebrates these artists four times a year with a three-hour long artwalk through downtown art galleries. Many of the galleries serve wine (some even have snacks), which is a must when you’re appreciating art. The next event is May 4, so mark your calendar! 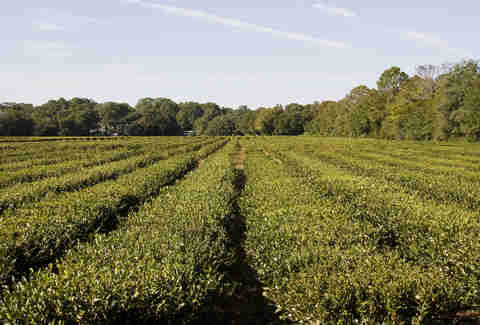 Here’s a fun fact: Charleston is the only city in North America in which tea is grown (which is probably why sweet tea is the unofficial drink of the South). The plantation is located just a 30-minute drive from downtown, and features a gift shop where you can sample a number of different tea varieties. You can also do a free factory tour or upgrade to a $12 trolley tour, which lets you observe the tea process all the way from when it’s first planted to when it’s packaged and sent out to be imbibed. On the second Sunday of every month, King Street shuts down from Calhoun Street to Queen Street from 1-5pm and turns into a European-style pedestrian fair complete with al fresco dining, live music, entertainment, sidewalk shopping, and more. The event is pet and kid-friendly (and excellent for people-watching). Charleston isn’t necessarily the most bike-friendly city in the world, but we’re working on it! Going for a bike ride is a classic way to see some of the city’s iconic architecture and explore its many nooks and crannies. This is a totally free adventure if you’ve got enough two-wheelers for your group, but if not, don’t fret: you can rent bikes from Holy Spokes for only $12 a day. We’ve already told you about a few of Charleston’s best year-round events, but what about the one-off stuff? Well, it just so happens we’ve put together a seasonal events calendar that highlights the coolest events of the current season, so whether you’re after ice skating in the winter or beach volleyball in the summer, we’ve got you covered. Charleston is going to the birds -- or, rather, you could be going to the birds in Charleston. 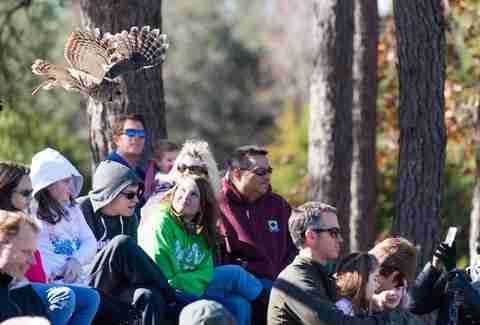 Consider skipping the popular-but-populous Aquarium, and heading instead to The Center for Birds of Prey out in Awendaw. The center features over 50 species of birds of prey (think: eagles, owls, and falcons), and is a pretty cool way to spend a couple of hours. You can take a guided tour of the grounds, see a flight demonstration, and see a few special exhibits for only about $18 per person. Many people might not know this, but Charleston is home to the first theater built in the American colonies, the Dock Street Theater. In addition, there are over 16 theatres and acting companies in Charleston putting on performances throughout the year, ranging from dramas to musicals and everything in between. Plus, with the newly redesigned Gaillard Center bringing in national talent and Spoleto & Piccolo hosting the world’s best acts in Charleston, you have shows that match pretty much every taste. Brunch isn’t a meal, it’s a way of life, and Charlestonians celebrate it in style. Everything from brunch buffets to bottomless mimosas can be found throughout the Holy City if you know where to look. For something a little different, keep an eye out for one of Bay Street Biergarten’s DJ-led themed brunches that will wash away your Sunday blues lickety split! Take some time to balance out all the eating and drinking and running around you’ll be doing with your out of town guests and center yourself with a yoga class -- a yoga class conveniently surrounded by beer. Many breweries, like Frothy Beard, Ghost Monkey, and Holy City Brewing feature yoga classes throughout the week, and for just $15-20, you can get an hour-long beginner’s yoga class followed by a pint of cold beer. It’s always good to detox before you retox! 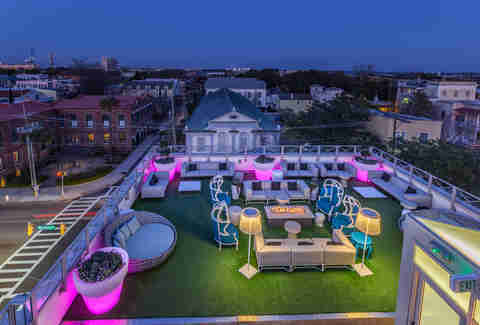 Charleston is home to over 20 rooftop bars, and probably 90% of them are located downtown. There’ everything from bars to restaurants to breweries to nightclubs, but they all have one thing in common: stellar views of Downtown and no ceilings to keep you down. The Black Fedora Comedy Mystery Theatre might be located smack dab in the center of tourist central, but the shows are good enough that it’s well worth wading through a sea of slow-walking visitors in order to experience one. Their shows combine mystery, murder, audience participation, and dinner in a harmonious blend of uproarious entertainment that will delight guests of all ages. If you’ve ever wished you could be Tim Curry in the movie Clue, this is your chance. Drinking craft beer is great, but every once in a while we all crave something cold, classic, and drinkable -- which is where the old faithful PBR comes into the picture. Rec Room is a no-frills dive bar whose claim to fame is that they’ve been the No. 1 seller of PBR cans in the world for the past four years. They’ve also got a bunch of arcade games, as well as some killer totchos (that’s tater tot nachos, for the uninformed). With so many creeks, inlets, and beaches throughout Charleston, it’s no wonder that watersports have become so popular here. 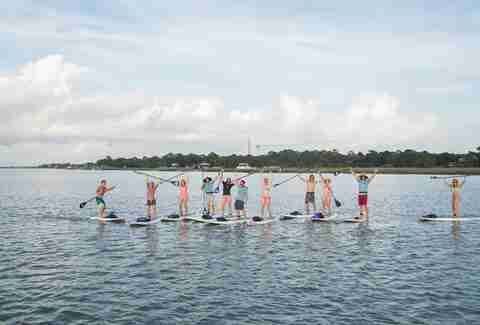 Consider renting a kayak or stand-up paddleboard for a few hours to explore on your own, or sign up for an official tour to have an instructor teach you the ins and outs while also guiding you through some of Charleston’s historical sites. Sweet tea is a southern staple, so it only makes sense that we Charlestonians would combine it with our other love: liquor. Firefly Sweet Tea Vodka is a local spirit that’s distilled and bottled right from Wadmalaw Island, so it’s easy to take a drive out to the distillery and taste some of their spirits (including some that you can only get at the distillery!) for only $6 a person. The PAC has a pretty stellar lineup so far this season, with a mix of events that are varied enough to please any interests. Country music concerts, Broadway shows, indie rock, wise-cracking puppets, The Price is Right Live… if you can’t find something to pique the interest of your guests at the PAC, you’re not looking hard enough. Going into their 26th year, the Riverdogs -- Charleston’s Class A affiliate of the New York Yankees (and owned in part by Bill Murray, FYI) -- aren’t showing any signs of slowing down. This year’s special event nights include Farmers Markets during the game, bring-your-dog nights, Elton John-themed fireworks displays and more! Tickets are usually pretty cheap, and it’s a great way to spend an evening. After all, baseball is America’s pastime for a reason! 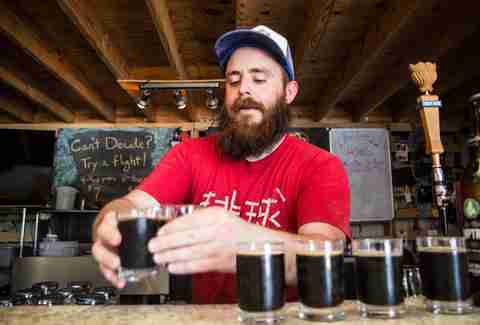 With over 25 local breweries in the county, Charleston is serious about its craft beer culture. While you probably won’t be able to tour all of them in one visit (and your liver would appreciate you not attempting that), you can plan out a mini-brewery tour on your own to sample some of Charleston’s local brews. Or, go all out and do an official brewery tour, which comes with the added bonus of a designated bus drive to cart you from brewery to brewery. Touring Fort Sumter is something everyone -- local and visitors alike -- should do at least once. Its historical significance can’t be denied, and the grounds themselves contain pieces of history, like mortar shells from the civil war still embedded in the brick walls of the fort. The tour includes a ferry ride to the Fort, which is an island in the middle of the harbor, so it’s kind of like getting 2 tours for the price of 1. For folks who have to be dragged away from the beach kicking and screaming, consider doubling down on said beach visit by actually camping there for the night or even the entire weekend. Edisto Beach State Park offers tent campsites that are right on the beach, and feature water and electric hookups, firepit, and more, so you’ll have no reason to ever leave the shore. 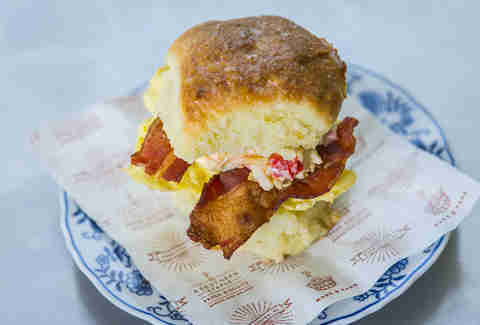 Charleston’s latest obsession is breakfast food, and you can get in on the craze with a DIY breakfast crawl of your own making. Start at Daps for a Fruity Pebble pancake, then head over to Millers All Day for some unicorn grits, and finish the day at Callie’s Hot Little Biscuit for -- you guessed it -- a hot little biscuit. If you love beer, like really love beer, then the annual Charleston Beer Fest on May 18th is the perfect event for you! They feature over 40 local and region breweries, live music, events, and food and your tickets go to help raise money for Palmetto Community Care, which helps treat and care for those living with AIDS/HIV in the lowcountry. The only thing better than sampling a lot of craft beer is sampling a lot of craft beer for a good cause! This tour combines water sports and Charleston history for a more unique perspective at seeing the city. You’re in charge of piloting your own speedboat (max 2 people per boat) through the Charleston harbor, stopping periodically for history and fun facts about the points of interest you pass. Spoleto and Piccolo are Charleston’s unofficial launch to summertime, when thousands of artists and art enthusiasts descend on the Holy City for 2 weeks-ish of dance, theatre, music, and comedy. You can take in local acts at Piccolo, or see imports from all over the world at Spoleto and infuse your guest experience with a little more culture during their visit. Be sure to book soon, as many of these shows sell out fast! The pineapple fountain is iconic of Charleston for a reason: it’s a gorgeous symbol of southern hospitality, and a must-see for those who’ve never been. Waterfront Park in general is a fun place to visit (as long as the weather is nice), and with the green marsh grass and brilliant blue of the harbor as that fountain’s backdrop, it’s a scene that’s practically begging to be used for a photoshoot. Sydney Gallimore is a food writer from Charleston, SC whose favorite thing to do in Charleston is eat. Follow along with her nom-ventures on her Instagram @QueenOfTheFoodAge.